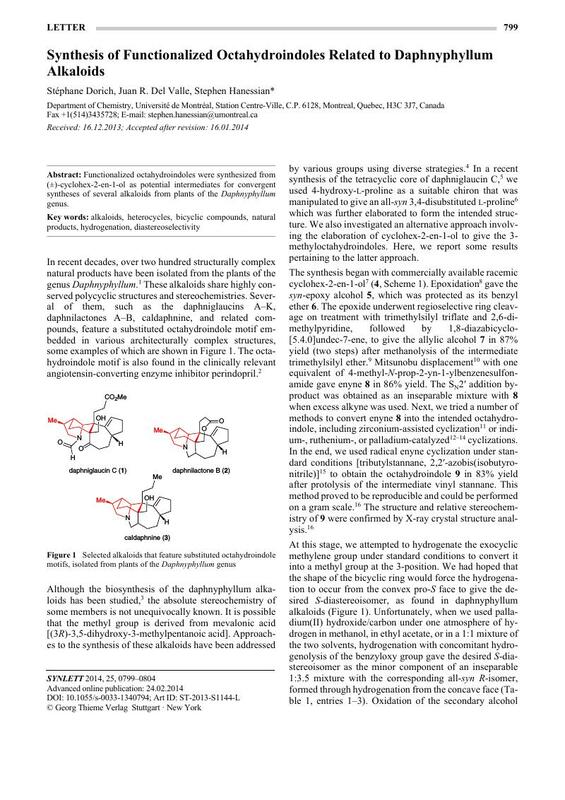 Functionalized octahydroindoles were synthesized from (±)-cyclohex-2-en-1-ol as potential intermediates for convergent syntheses of several alkaloids from plants of the Daphnyphyllum genus. 20 When the elaboration of bicyclic intermediates was carried out with diastereoisomers 10 and 11 separately, they were found to show similar reactivities and yields to one another. 28 We observed that, among other factors, the rate of addition of Br2 affected the yield; optimal yields of 26 were obtained when Br2 was added rapidly under vigorous stirring. 31 With THF, Et2O, toluene, or THF–HMPA (10:1) as solvent. All the above reactions were also tried with addition of the base to the premixed bromo ketone and electrophile. Also, extended reaction times (2‒3 d) were tried, but produced no improvement. 32 The chloro ketone analogous to 26 was also formed but gave the same unexpected results during attempts to form the corresponding chloro enol triflate. 35 Crystallographic data for compounds 9, 11, 17, 27, 28, and 32 have been deposited with the accession numbers CCDC 968290, 968291, 968292, 968293, 968294, and 968295, respectively, and can be obtained free of charge from the Cambridge Crystallographic Data Centre, 12 Union Road, Cambridge CB2 1EZ, UK; Fax: +44(1223)336033; E-mail: deposit@ccdc.cam.ac.uk; Web site: www.ccdc.cam.ac.uk/conts/retrieving.html.